Isle of Wight Aggregates Ltd is the largest marine aggregate supplier on the Island based at Medina Wharf, West Cowes. Our staff experience ranges between 10 to 35 years, and all are qualified plant and machinery operators. We pride ourselves in supplying the best quality materials at competitive prices and offer an island wide delivery service. Our wharf has an excellent safety record and we are 14001 certified. Regular Safety & Environmental inspections are undertaken by external auditors and the parent companies. Our aim is to use local companies where possible for repairs, supplies, machine hire and haulage. We also subscribe to many charity organisations such as Air Ambulance and Earl Mountbatten Hospice to name a few. Isle of Wight Aggregates Ltd is a Joint venture between Tarmac and Cemex. Both of our parent companies have operated individually on the island for around 35 years and are both large international companies producing a vast selection of materials. They both have their own fleet of ships dredging from various locations around the UK. A significant proportion of the demand for aggregates is satisfied from river, lake and sea beds. Marine aggregates play an important role in replenishing beaches and protecting coastlines from erosion. Satellite navigation may be used to position vessels precisely within licensed dredging areas. Vessels trail a pipe along the marine floor at speeds approaching 1.5 knots and use powerful suction pumps to draw sand and gravel into the cargo hold. Dredged material is discharged at wharves and other facilities, where it is processed, screened and washed as required. 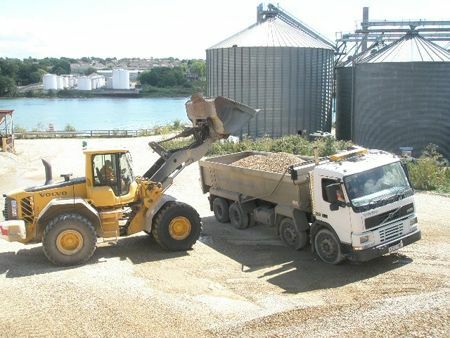 For your expert marine aggregate supplier serving the Isle of Wight, contact Isle of Wight Aggregates Ltd. We guarantee you will not be disappointed by our fast and efficient service!